Associate Professor Ruslan Latypov presented some new developments during a seminar in petroleum extraction and refining at Perm State University. His report was titled “Radiophysical Methods for Geophysical Applications”. Dr, Latypov talked about equipment for oil well research and in-situ refining catalysts. In-situ catalysts and steam-assisted methods help decrease the ratio of heavy components of petroleum, sulfur, and nitrogen, as well as its viscosity and density. Such a procedure eases transportation and, therefore, the costs. High pressure and catalyst use facilitates partial refining of non-traditional oils in a reservoir. This not only increases extraction rates but also benefits the environment because toxic waste is partly left in the reservoir. Several devices were demonstrated during the seminar – a nuclear magnetic resonance logging complex, lab and field whole core NMR analysis devices, a HD sonic well scanner, and an automated system of wireless geological technical analysis. Four departments of the KFU Institute of Physics have contributed to the construction and testing. All the shown equipment is among the best in the world. In particular, the NMR analysis device doesn’t have competitors at all, according to the developers’ statements. Its usefulness is not limited to petroleum industry as it can be used with equal effect in construction, chemistry, and food production, among others. Lukoil representatives were quite intrigued by the presentation, especially because the mobile NMR device helps detect oil quality in real time. In comparison with hours or even days taken by lab tests, the benefit is evident. Engineer of the Institute of Physics Mikhail Doroginitsky commented, “There is currently only one analog in the world, but its combined efficiency is many times less than that of our prototype, and our device’s price is competitive as well”. As Dr. Latypov told us, those were not all the developments that are in the works at KFU. For example, another magnetic logging device was recently provided for industrial usage – it utilizes such methods as magnetic resonance logging, electromagnetic propagation logging, and gamma ray logging. 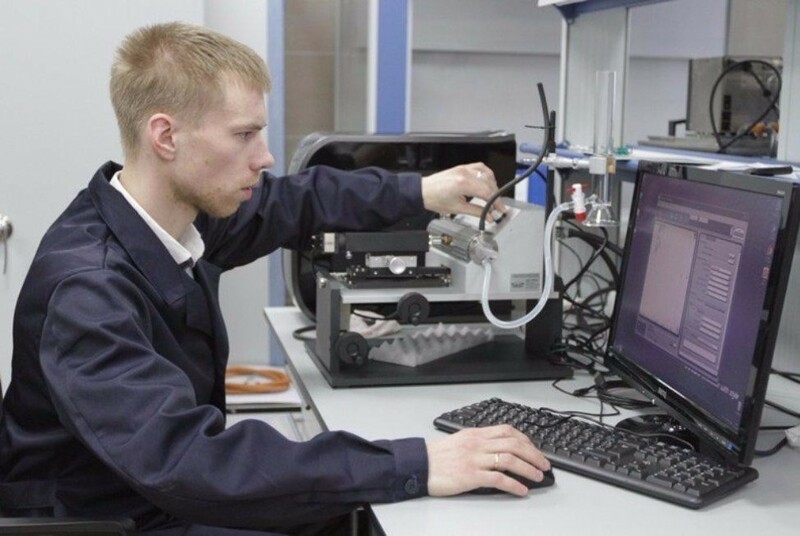 The Institute of Physics now has a new ambitious task – to establish the first Russian well testing lab which would make tests in the packer isolation zone with the use of infrared spectroscopy, NMR spectroscopy, and dielectric leakage. The KFU delegate also spoke about the petroleum industry education at KFU. He mentioned that the Space Technology Transfer Center will be opened soon; the Center’s objectives will be to train experts in remote sensing and aerial surveying.